Now that the Hi-Def video format wars are over, the MAC obsessed can now turn to holy grail of digital backup, a Blu-Ray 6x Superdrive. And MCE Technologies is there to provide them. 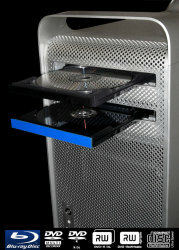 Capable of burning both single and dual layer Blu-Ray DVDs, the MCE Superdrive can archive up to fifty gigabytes of information on a single disc. That translates to being able to backup an entire audio and home video collection on a single disc and probably have room to spare. Or, users can image drives to create handy system backups in the event of a calamity and still burn to a single disc. And with current technologies working on multilayer discs that can hold up to 200 GB and beyond, this Blu-Ray burner has only the sky as it’s limit. Firmware notwithstanding. It’s capable of burning at 6x for Blu-Ray, 16x for standard +R/RW DVDs, can burn CDs at a blazing 40x, as well as burning capabilities for DVD Ram at and HD- DVD-ROM at 5x. It even has Lightscribe. MCE says that the MCE 6X Blu-ray Recordable Drive is compatible with any MacPro or PowerMac PC and is available immediately and will set you back about $500 US (with a single Blu-Ray blank disc included).